Fred, one of six children of Edward Horace and Amelia Thomasena Badger, grew up at Home Farm, High Street, Campden, now Badger’s Tea Rooms. Their barns and farm buildings stood on the site of the present Badger’s Field Housing in the field below the Sheppey. Fred and his father also farmed Lapstone on Conduit Hill where father and son made it the longest tenanted farm on the Northwick Estate. Captain Spencer Churchill owner of Northwick House annually entertained his tenants and to celebrate his eightieth birthday gave each of them gifts of long pipes. The tenants reciprocated, presenting the Captain with a silver salver suitably inscribed with all their signatures. Following the Captain’s death Fred managed to purchase the salver at an auction sale. Fred moved into the farm house at Lapstone in the 1930s and spent all his married life there with his wife, formerly Ellen Roberts, a housekeeper to the Arts and Crafts jewellers, Arthur and Georgie Gaskin, who had moved with them to Campden from Birmingham in 1924. Although Fred and ‘Nellie’ did not have any children of their own, their evacuees during WWII looked on them as second parents. Elizabeth Argent recalls that on the night that Coventry was bombed Fred, who was on night fire watch, rushed home to his wife who was sheltering in the cellar and announced that Campden was on fire. He returned a little while later to say that it was Coventry not Campden. He was described as a quiet man with a dry sense of humour and a ‘magpie’ disposition. He collected a vast array of old farming implements, not to mention numerous music boxes and other bric-à-brac inside the house. The polished cylinder music boxes with their tinkling tunes were a special delight to visiting children. The catalogue for the auction following Fred’s death in 1975 listed a positive Aladdin’s cave of fascinating items too numerous to mention, including an oak shoe shine stand on bobbin turned supporters, two cooks hats, a collection of horse brasses, thirteen music boxes and a Staffordshire figure of a Girl with Tambourine. In all there were five hundred and five lots, china, silver, brass, paintings, books, and magnificent furniture. Despite Fred’s tendency to hoard old things, he had the reputation for keeping the tidiest rickyard on the Northwick Estate. 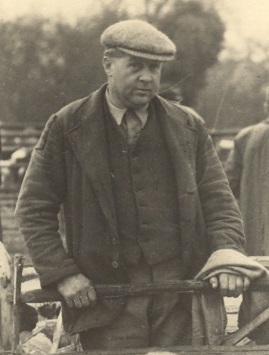 He received awards and the prize for the best kept small farm in annual competitions of Moreton Show of which he was a member and he won all the different awards for which he was eligible in the contests run by Gloucestershire Root, Fruit, and Grain Society to which he also belonged. He greatly enjoyed these competitions and won prizes with his Charolais dairy herd and splendid Hereford bull. In the latter part of his life he taught three of his female employees, Alice Stanley, Betty Leadbetter and Barbara Brundle, his skill of dry stone walling. Together with his manager, Stan Brundle, they rebuilt a long stone wall on his farm beside the main Campden to Springhill road, a fitting monument to one who was an upholder of the old farming tradition. Anybody who took a stroll or drive up Conduit Hill in the 1960s was able to watch them at their work. It is said that he was a good and generous employer to his loyal staff. Fred was known for his great sense of fun, a twinkle present in his eyes and a mischievous grin on his face. He was an active committee member of the Scuttlebrook Wake Committee and often participated in the annual fancy dress parade, once dressed as a very convincing tramp. He was also one of the few people in the town able to run a public ox roast for great occasions like the Coronation or Jubilee and his skill was frequently sought by neighbouring villages. After his wife died, Fred called daily on his nephew, Eric Haines, and his wife, Phoebe, who took him on regular outings in their car. As a keen supporter of traction engines he was also driven all over the country to steam rallies. Fred, devoted to the memory of his wife, kept her ashes in a casket on a gate leg table that was dressed with a white linen cloth. Beside the casket lay both an open bible, a picture of sheep on the Welsh Hills and a vase of fresh flowers. Following Fred’s cremation in 1975 both caskets were interred in St. James’ churchyard. Known to everyone locally as Uncle Fred, he left instructions for his executors to buy a suitable residence in Campden for housing a person willing to look after old people who might need assistance with every day affairs. It was agreed that this £100,000 legacy would be included in a Cotswold District Council warden-supervised scheme, now known as Badgers Field, putting this well-loved Campdonian in company with Sir Baptist Hicks and other great benefactors of the town.